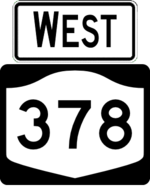 NY 378 is a short touring route connecting US 9 in Colonie with US 4 in Troy. 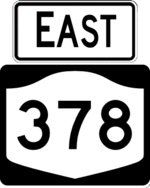 It originally followed Menands Road from US 9 to NY 32. It was realigned in the 1950s to follow the new highway connecting US 9 to the Troy-Menands Bridge (then numbered as part of NY 2). When NY 2 was truncated to US 4 in Troy in 1978, the bridge and road connecting to US 4 became an extension of NY 378.